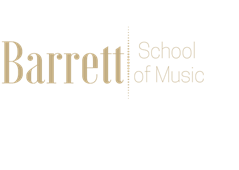 Welcome to Barrett School of Music! Please complete the following registration form. Students' time will always be respected by the teacher beginning and ending lessons on time. Therefore, if a student arrives late to a lesson, the lesson will still end at the scheduled time. This policy also ensures your own lesson time will not be infringed upon by another student. If you need to miss a lesson, please give at least 24-hour notice in order to receive a makeup lesson. Without 24-hour notice, the lesson will be forfeited without reimbursement. If you're going to miss more than two consecutive weeks of lessons at any given time but you would like to reserve your current time slot, then you will have the option of paying for those missed lessons (in excess of 2 weeks) to preserve your spot. Otherwise your time slot can be given to a consistent student at anytime during your absence. All invoices will be emailed at the last lesson of each month for the following month (i.e. Your August invoice will be sent during the last week of July). Payment is due upon receipt. If we have not received your payment by the 10th of the month (i.e. the 10th of August for August lessons), your credit card on file will automatically be charged for the balance on your account.